Design Your Company for Self-Organizing Teams. If we think of our company as a game, we realize working there may not be as fun, agile or productive as it could be. The key is to design for self-organizing teams. Multi-player video games show us the way as players collaborate, improvise, adapt and spontaneously respond to opportunities. In many games, there is no voice chat between players. This means team collaboration and self-organization happens continuously, without traditional management and without conversation between players. It’s a level of proactive collaboration we want teams in companies to do. So why doesn’t it happen in companies? Your organizational structure defines the behavior of employees more than culture does. Organizational design, or organizational structure, drives culture more than leaders do. The reason is, reporting relationships within the company determine how employees behave. Any time you have a structure where the manager determines employee job security, recognition and promotion, employees will make decisions relative to that relationship rather than what they would actually do if the business was their own. 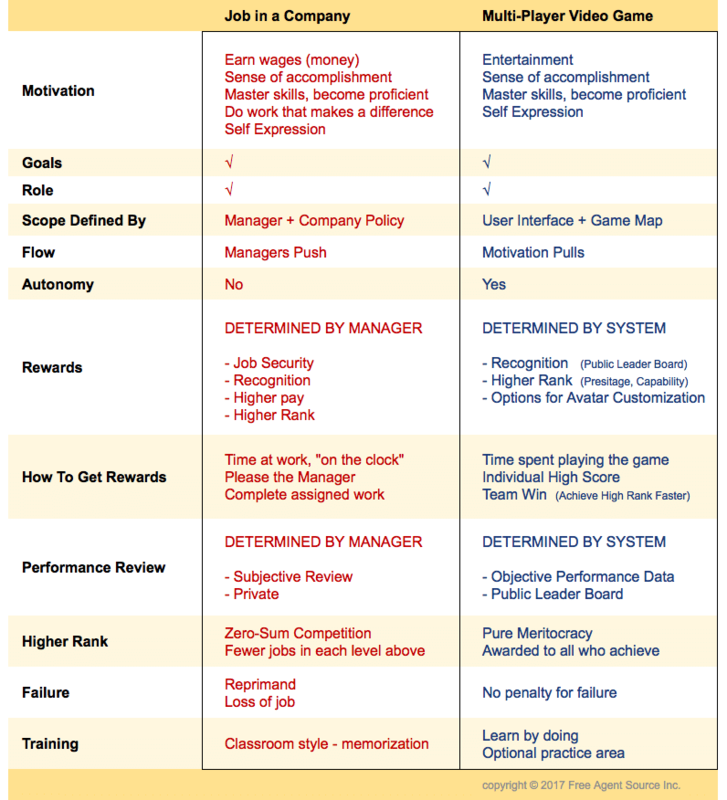 Here’s a table which compares jobs in a tradition company to true self-organizing teams in video games. It is humbling experience to play these games as a noob (“newbie”, new guy / new lady player). You get knocked back to the starting point faster than you can say, “Where did that hit come from?”. It probably came from some player in a zen state of being whose mind, fingers and game controller have become one, ’in the zone’. The question is not, ‘Are effective self-organizating teams possible?’. They most certainly are, and video games prove not only the potential, but also the extraordinary advantage over traditional organizations. For me, the questions are: ‘How does it work?’ or ‘What makes it work?’ Let’s look at a successful game. 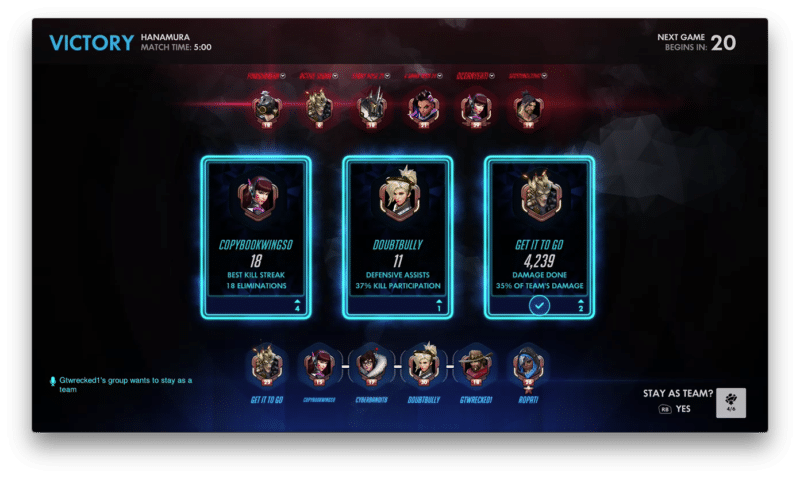 Overwatch was named game of the year 2016 by Wired Magazine. 7 days after launch in May 2016, 7 million people had played the game. 4 weeks later, that number was up to 10 million players. 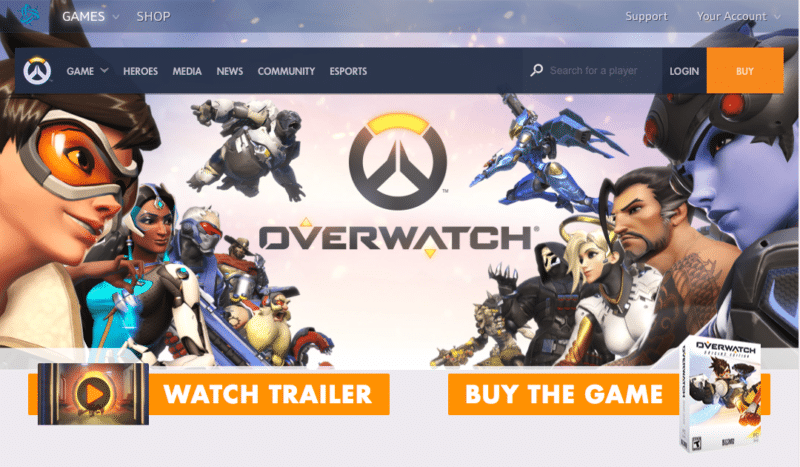 By October 2016, 20 million people had played Overwatch and it has continued to grow in popularity since then. This rapid adoption was accomplished without formal training or traditional corporate management directing players to join or take a training course to prepare. 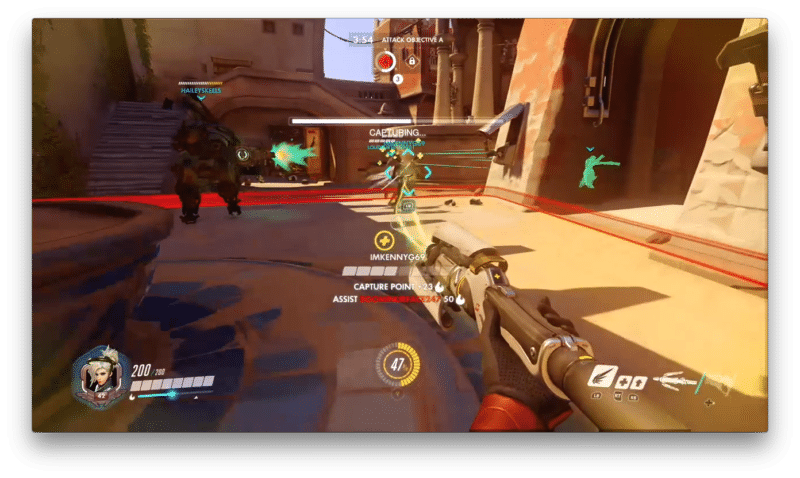 In each Overwatch match there are two opposing teams of 6 players. Each player can select a character from 23 characters available. That allows for a dizzying range of possibilities in team composition. There are 14 maps. Some characters are more suited to the situation of a map than others, but all characters can be played in any map. Proficiency and experience of the player can compensate for the character’s weaknesses or game map. It also matters whether you are attacking or defending a point on the map. Game Play: choices delegated to players (autonomy) to change the outcome of the game, to win. Here’s a character installing a turret again after it was destroyed. 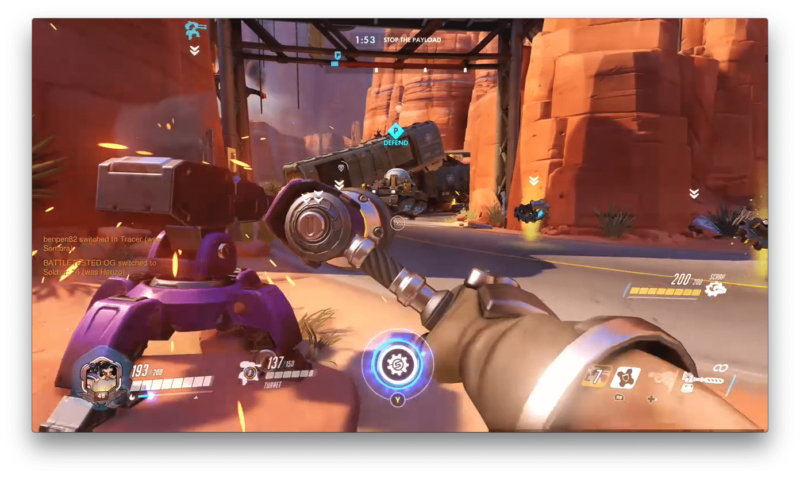 In this game, the turret kept the opposing team pinned down, who ultimately lost. Choosing the location for your turret matters. If you put it in open space, it is easily destroyed by a sniper or rocket. If you hide it too far away from battle, you only have a narrow range of view across contested area and therefore less effective. Here’s a healing character boosting the health of others while they control territory. In this next shot, a technical character has just installed a teleporter, which reduces transit time back to the game space. No one tells the player whether to install it or where to install it. MOTIVATION: Recognized for the most “awesome” play. Similar to “game highlights” and “instant re-play” in televised sports. Self-Organization Doesn’t Work Without Game Parameters and Hints. 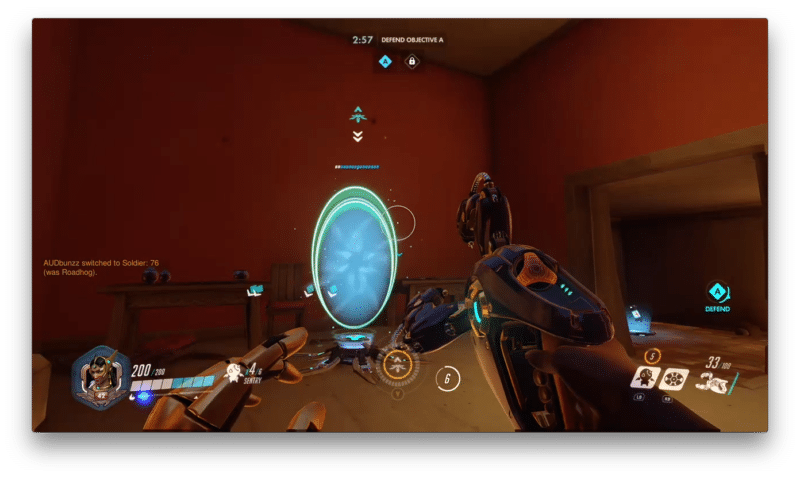 As in most games, Overwatch displays hints. 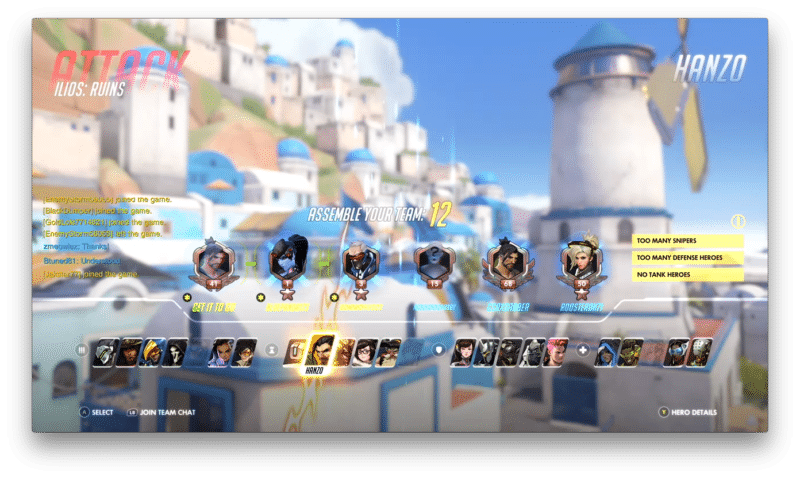 During character selection, it shows team members whether there is diversity of character strengths. 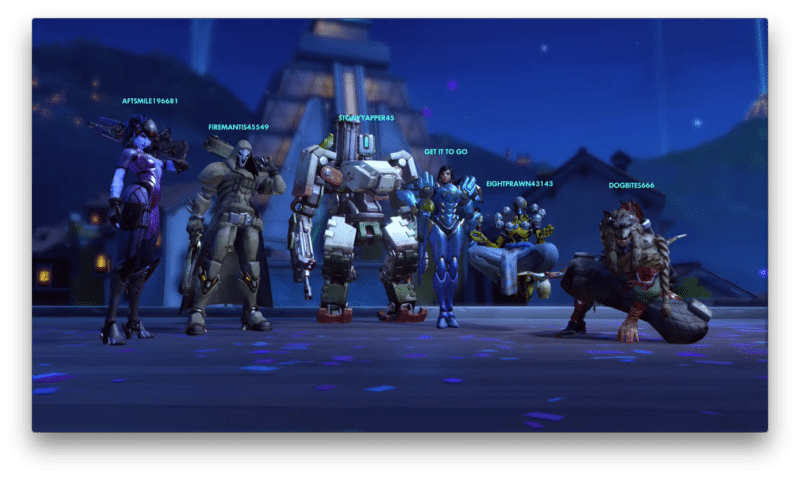 Overwatch game designers chose to enforce no redundancy of character types. Some games allow redundant characters, which potentially creates more imbalance between teams. This is a subjective design choice. For most of us working, building, living on the forward edge of innovation, self-organization is where the future of productivity lies. But what makes it work? If we put ourselves in a room and give ourselves clearly defined goals and roles, it may still become an un-productive, chaotic mess. Why? Self-organization depends on more than just clearly defined goals and roles. Game developers know this. They carefully construct conditions that replace the roles of leader and manager, to ensure self-interest of each player creates collaboration and self-organization. Let’s compare a traditional corporate hierarchy to self-organiing teams in multi-player video games. GOALS and ROLES Video games certainly have clearly defined goals and roles, as do many companies. Goals and roles aren’t enough for self-organizing teams to occur successfully. SCOPE Scope is the WHERE and HOW to achieve goals. In a video game, the map sets boundaries on where play is allowed to occur. Other properties of the user experience also control what is allowed, such as climbing on top of a building, jumping off a building (does this harm your character or not). In business, WHERE and HOW are controlled somewhat by company policy, which sets boundaries on conduct, but WHERE and HOW are mainly by controlled by managers. This means WHERE and HOW are directed by a person who will interpret those boundaries with subjectivity and bias which each of us has. This results in variation and inconsistency from one department to the next within a company. FLOW What drives activity through the game (game flow) or through the company? There is a fundamental difference between the two and it’s why we sometimes hear business owners ponder, ‘Why don’t my people think like owners or entrepreneurs.’ In a video game, players’ motivation PULLS players through game play as they compete to win, earn a sense of accomplishment, gain stronger abilities, higher-rank, more customization. Players know, rules applied objectively. The same rules apply to all. It’s fair. When we organize our business as a hierarchy where managers have the power to judge and reward employees below, employees will instinctively set aside their own entrepreneurial instincts and focus intensely on obtaining favorable judgement from the manager in order to receive the reward of continued employment, higher pay and possibly a promotion. Employees have similar motivations as gamers. But the path to fulfilling those motivations in a job, is through the manager. Economic survival of every employee depends on this. Most businesses expel employees whose entrepreneurial instincts deviate from managers’ expectation. This arrangement means, managers PUSH employees in varying levels of intensity. AUTONOMY In a video game, players have true autonomy within the boundaries of the map and the user experience. Players are never expelled for normal experimentation. They are only rewarded for success. The system determines whether players succeed, there is no person to decide who is promoted to the next level. In business, employees do not have true autonomy because even under the most emotionally intelligent leaders, the leader has power to judge AND reward employees below him / her.. And it goes one step further. Leaders and managers are almost never judged in a similar manner by their employees, nor are leaders’ rewards determined by employees below. I don’t consider employee surveys and 360-degree feedback to be valid judgements because they usually are non-binging. That is 360-degree feedback surveys are usually not a final determination of whether a manager keeps his/her job or how much s/he is rewarded. HOW TO GET REWARDS In a video game we are usually rewarded for time spent, individual high scores and our own success is accelerated by team wins. In business, rewards are distorted by the presence of a manager who has power over economic security of every employee. Our path to rewards on the job is to be at work (either virtually or the office) please the manager and complete work assignments. In the table above, I intentionally prioritize pleasing the manager over completing work assignments, because managers often re-direct attention to other priories which mean employees may abandon current work assignments. PERFORMANCE REVIEWS We’ve already touched on this. 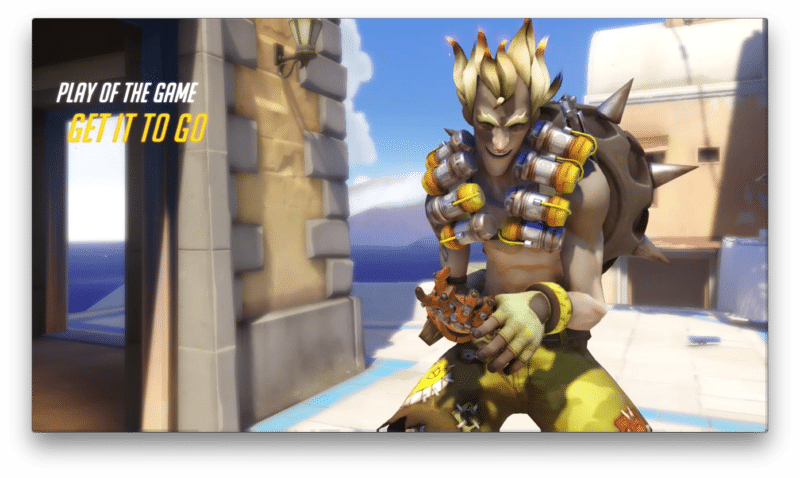 In a video game performance is objective, determined by the system. The same standards are applied to every player. In business, performance reviews are usually determined by only one person, the manager, and by definition those reviews are subjective. Even the most emotionally intelligent, objective leader will have their own perspective and bias. HIGHER RANK In a video game, anyone who completes or demonstrates pre-determined, measurable levels of proficiency, is awarded higher rank and thus can earn stature in the community. If 100% of players fulfill these, then 100% of players will earn higher rank. Any company organized as hierarchy has fewer roles at each level of management. By definition this structure ensures, not everyone will achieve higher rank even if they have fulfilled objective criteria. When more people have fulfilled objective criteria than roles available for promotion, the choice for promotion will be made as a subjective choice. That creates office politics. If we think about business as self-organizing teams, supply chain management comes to mind. Effective supplier relationships are governed by objective criteria which ensure all members of the supply chain clearly understand goals, roles, boundaries, reward to be paid, quality, quantity, timing of delivery. When these are clearly defined, there is no need for management oversight. It works as a process governed by objective criteria and boundaries. In future posts, we will discuss this in more detail. As you can see, most companies aren’t built for self-organizing teams. What to do if you want to move your company in that direction, to capture the power and agility of self-organization? Do the hard work first, which means you have to define in objective terms, not only goals and roles, but all the other necessary definitions to achieve full autonomy among participants. At Free Agent Source, we recommend starting with knowledge work that isn’t part of your core business. Information Systems, Marketing, Operations and other departments often have aspects that can be delegated to consultants. A consulting relationship removes all the “noise” that a traditional employment relationship has. No illusion of a career path or promotion. No subjective rewards. Relationships with consultants are simpler than an employment relationship. With a consultant, the relationship is simplified to: do “x”, get “y”. This is the essence of self-organizing teams. It’s also why so many professionals prefer a consulting relationship over traditional employment. The terms are clearer, which creates more satisfaction, a sense of accomplishment on both sides. And the simpler relationship by definition creates more autonomy. With traditional consulting, yes, cost of consulting, poor loyalty and loss of institutional knowledge are concerns. That’s not how it is at Free Agent Source. We un-pack these issues in our program called “Extraordinary Advantage of an Agile Workforce”.